We’d love your help. 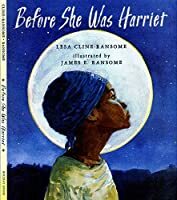 Let us know what’s wrong with this preview of Before She Was Harriet by Lesa Cline-Ransome. To ask other readers questions about Before She Was Harriet, please sign up. Age for whom "Before She was Harriet" would be appropriate? Amy Elementary school age children-especially if they have learned about her. My 2nd graders enjoyed this book. I love children's nonfiction books about important historical figures, because I think it's so important that little ones are taught not only fairytales, but real-life matters and history, too. Harriet is certainly a woman that every children should be taught about and inspired by, and I loved the twist in the sense that this book traces her life backward, before coming full circle 'round to her as a peaceful old woman, basking in th Assigned reading for MLIS 7421: Multicultural Youth Literature. 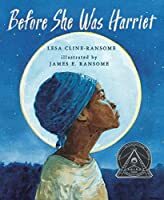 There are plenty of picture book biographies of Harriet Tubman, but the Ransomes have created a beautiful and poetic look at her life. Each time the page turns, another part of her life is named and shown. Old woman, suffragist, General Tubman, Union spy, nurse, Aunt Harriet, Moses, Minty, Araminta...each of those aspects led to the old woman who was "worn and wrinkled and free." While the beautiful watercolors show details of Harriet's world - horse-drawn buggies, ladies in long skirts and wide There are plenty of picture book biographies of Harriet Tubman, but the Ransomes have created a beautiful and poetic look at her life. Each time the page turns, another part of her life is named and shown. Old woman, suffragist, General Tubman, Union spy, nurse, Aunt Harriet, Moses, Minty, Araminta...each of those aspects led to the old woman who was "worn and wrinkled and free." While the beautiful watercolors show details of Harriet's world - horse-drawn buggies, ladies in long skirts and wide hats at a suffragette meeting, boats slipping across a river to freedom - the text is just as lovely. Lines like, "before her voice became soft and raspy it was loud and angry rising above injustice," capture her spirit. The spirit that was in "a wisp of a woman with the courage of a lion." Some of my favorite scenes are those with Harriet in the night, clutching her walking stick, or looking up at the stars with her father. But I think the one I like best of all shows Harriet being helped onto a train by a Pullman Porter. It links all she did to free her people with the continued struggle and long road to the Civil Rights era. This is a must for school libraries and public library children's collections. Harriet Tubman was much more than just the conductor on the underground railroad. This talks about all parts of her life and shows that she was just so much more than the one thing we know her for! I love it. An inspiring story - one I will share with my students this year. Beautifully written. Harriet Tubman is about her life and all the roles she played. It describes her roles past what is typically thought of her being the guide for the Underground Railroad. They start from when she is old all the way down to her youth to show how she changed and grew as a person, and how she contributed so greatly to our history. Freedom song is about a boy who was born into and raised as a slave. He talks about the song he always sang that gave him hope for a better life. It shows that no matter the obstacle he was faced with, he always had hope and never gave up. In the end, he finds himself a free man thanks to many courses of action, including being sent down the Underground Railroad. The way I plan on connecting the two books will show significance of Harriet Tubman and all she did for the people without voices. I will start with fiction book to introduce students to what life was like for slaves. Then we will talk about the hardships millions of people had to live with for hundreds of years. Once we finish, then I'll read the non-fiction book about Harriet Tubman. This will help students understand why Harriet Tubman was such a hero to these people and just what situation she was taking them out of. Then I will go further to explain that she is even more significant because she didn’t only help hundreds of slaves as she is most well known for, but she took was a large part of history in many different times of her life. I will use the KWL chart for this book to introduce students to the idea of slavery and some of the heroes that put themselves at risk to help them get to freedom. I will give them some discussion questions like what do you know about slavery? To help them fill out the K. Then I will ask them what things they don't know about, which will be the W part, and after reading, we will discuss new material the students learned as a group, then they will individually fill out the L.
Premise/plot: Before She Was Harriet is a picture book biography of Harriet Tubman written in verse. The picture book opens and closes with Harriet as an old woman. The poem looks backwards on her life. Each section begins with "Before she was. First sentence: Here she sits/ an old woman/ tired and worn/ her legs stiff/ her back achy/ but before wrinkles formed/ and her eyes failed/ before she reached/ her twilight years/ she could walk for miles/ and see clearly/ under a sky lit only with stars. Fiction Book: Juneteenth for Mazie by Floyd Cooper. Published 2015. Before She Was Harriet is about Harriet Tubman's life and her different roles during different stages of her life. I chose to pair Before She Was Harriet with Juneteenth for Mazie. The book begins with Mazie being upset at being told no. It's too late to play outside, too close to bedtime to have a cookie, and Mazie is too young to stay up late. Her father begins to tell her about her great-great-great- grandpa Mose who was a slave and heard "no" even more. Maizie learns about her ancestors' hardships, their hope for freedom and a better future, and the significance of celebrating Juneteenth. Wow. Just, wow. Stunning. Best book about Harriet Tubman I’ve read. She was truly so much more than her name. Wonderful and powerful. Beginning with Harriet Tubman as an old woman, this story traces her role as a suffragist, during the Civil War, as a conductor on the Underground Railroad leading others to freedom, and as a slave working the fields in Maryland. The almost lyrical text is simple but powerful, speaking to Harriet Tubman's strength and determination to fight for freedom. Recommended for grades 4 and 5, students learning about Harriet Tubman will certainly make connections while learning new Wonderful and powerful. Beginning with Harriet Tubman as an old woman, this story traces her role as a suffragist, during the Civil War, as a conductor on the Underground Railroad leading others to freedom, and as a slave working the fields in Maryland. The almost lyrical text is simple but powerful, speaking to Harriet Tubman's strength and determination to fight for freedom. Oh. My. This is a gorgeous book - the prose and the illustrations are just wonderful. Half-way through tears were running down my face as Naomi read about the life of Harriet Tubman, an American Original, an Indomitable Spirit, whose life inspires us to live as we ought - to do what is right and just. Definitely lyrical and the simple language conveys the story of a very important woman in history. To touch on her childhood and provide a glimpse into the life of Harriet as she became older had a nice effect and illuminati things I hadn't known. A very inspiring book for young people and terrific picture book for young readers, the illustrations were excellent. As I told a librarian waffling whether to get this or not since they already have multiple books about Harriet Tubman, "It really is a wonderful read, the way they tell her story in a way that feels unique and inspiring." Both text and illustrations make this book a work of art. I learned new things about Harriet Tubman and was reminded of her bravery. I really hope the Coretta Scott King Committee takes a close look at this one, the Caldecott Committee too. From the advanced reader copy. Both illustrations and text are absolutely beautiful. While this is just an introduction to Harriet Tubman and you'll likely want to pair it with other books (or at least a lot of discussion), this is a wonderful biography to introduce this remarkable woman. Y'all. This is so beautifully written - a poem with perfect meter that compels you to read it just right. Just so artfully and thoughtfully created, it's truly a beautiful tribute to a heroine who deserves such care in the telling of her story. This beautifully illustrated poetic biography takes you backwards and forwards in the life of Harriet Tubman. Unlike a lot of other books about her, you learn more about her life before she escaped slavery. The watercolors really are fantastic. Good for older kid or preschool storytimes. I really really wish there was more information about her experiences as a general, spy, and leader, but there are other books that fulfill that role. This would be a great introduction to Harriet Tubman.